YOU know how important water is to a cat’s life and that moving water is far more attractive to them than still water. But how do you determine which cat fountains are the best? By price or quality? Longevity or food safeness? Ease of cleaning or attractiveness? How about by all six? 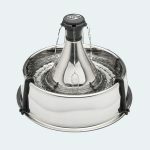 Recognized as the most durable, highest quality, most food safe, easiest to clean and by far the most attractive – and with designs for every breed and temperament – the only objection ever expressed about a Thirstycat fountain is the price. 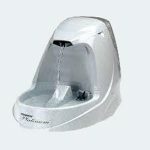 And the initial price is higher than most, but over several years, a Thirstycat fountain is the least expensive cat fountain you can buy. Why? Because our filtration system lasts so long, while all others need replacing at least every three weeks. 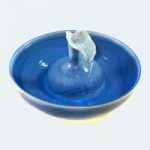 The Pioneer Raindrop costs $45 to purchase and over a five year period, purchasing the necessary filters at the minimum recommend rate of every 3 weeks will bring the total cost for purchase and filters to $270. The Drinkwell Avalon costs $80 to purchase and over a five year period, purchasing the necessary filters at the minimum recommend rate of every 3 weeks will bring the cost to $300. The Drinkwell 360 costs $70 to purchase and over a five year period, purchasing the necessary filters at the recommend rate of every cleaning or about once a week will bring the total cost to $590. Thirstycat Fountains cost on average $140 to purchase. (Many are much less.) Our carbon filters last six months or more (we use 60 times the carbon of other brands) and our foam filters last two years. Using both the carbon and the foam filters, over a five year period the total cost including purchase price will be $230. 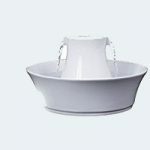 And all the while you, and your cats, will be enjoying the most beautiful and healthful and easiest to clean cat fountain money can buy – for less than any other.